A FRIDGE FULL OF FOOD...: Blackberry & Cherry Cobbler--Just like Mom's! 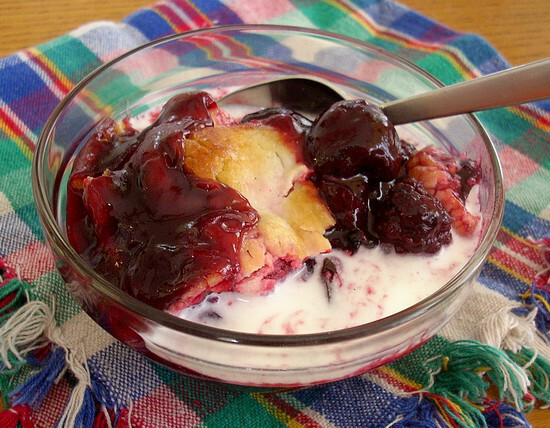 Blackberry & Cherry Cobbler--Just like Mom's! When I was a kid I was the oldest of five. With being the oldest and the oldest daughter I quickly became my mother's sergeant at arms in the kitchen. Growing up, we planted an acre garden across town on some land my dad owned that also came with enough raspberry and blackberry brambles to sustain us with fruit throughout the summer, and frozen, through the winter. We also canned apples from my Nannie's three trees in her backyard. This made for the most common winter desserts at our house being apple crisps and berry cobblers. Guess who was in charge? Yep, me. Even at nine or ten years old I could whip together the family dessert and move on to helping mom with the rest of dinner. My mother's dessert philosophy was simple: keep it sweet, keep it simple, and let the fruit be the star so our crisps and cobblers contained very little additional spices. A tiny bit of salt to heighten the flavor, a little vanilla to round it out, maybe a sprinkle of cinnamon for the apples but that was it. She was right. I still make my crisps and cobblers that way so that all you think when you bite in is how wonderful the fruit tastes. To make Pie crust: Mix salt into flour. Cut butter into flour with pastry blender or forks until coarsely distributed. Pour in a few tsps of water at a time until a dough forms that is still dry enough to roll out using a little extra flour on the board or counter. Makes 1 single crust. To assemble cobbler: Simply mix the berries, sugar, salt, flour, and zest together in a bowl and pour into cooking sprayed medium casserole dish. Top with pie crust, tuck in edges. Make several slits along crust with a sharp knife to allow steam to vent. Bake for approx 30-40 min at 375 degrees or until fruit is bubbly and crust is golden brown. Serve naked or with cream or ice cream. I didn't know that about you and mom. That looks good! Oh how I wish I had some cherries right now! Looks great! 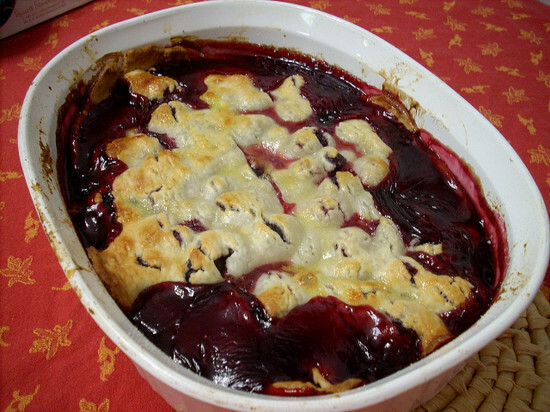 Berry cobbler is comfort food to the nth power, and I absolutely love cherries! Mmm, love the picture of the whole dish, I wouldn't be able to wait for ice cream! you can't go wrong, you just can't. i wish i had a great big bowl of this and some vanilla ice cream right now! I have a personal favorite~berry crumble. It's made with blueberries and blackberries but I've been short-cutting my way with streusel topping. This recipe and photos made me take out my rolling pin! And sure I am heading to the store tomorrow for a gallong of french vanilla ice cream. Thanks for wreaking my diet, hehehe. Oh, I love cobbler, and that looks sooo good. Beautiful picture too! Mmm gotta love cobblers! I can't wait till berries are in season so I can make some fresh ones! Oh wow, that's a gorgeous cobbler! Kenneth--You didn't? I always made dessert and a lot fo the time for the last couple of years I made dinner too. I also always made the rest of you guys breakfast every morning.Do you remember that? Brilynn--Hope they'll be as good this year as they were last year. I'd love to put more in the freezer. Rachel--No way! Coffee mate? That's wild, huh? Sher--Thanks, Sher! I love it too so there's only one crust. More berries, less crust. Jes--Yes! And peaches. Can't wait for the peaches to come in. Dang that looks and sounds like my grandmother's cobblers! Cobblers should be simple and just a little sweet. That looks so good, I'm drooling. I LOVE berries. I have some frozen cherries in the freezer right now - I just have to make room in my busy baking schedule to make this! And I agree with your mom about letting the fruit be the star. No. I do remember you getting us up for school. Tanna--Yep, that's the beauty. Just like our mothers nad grandmother's made. Madam Chow--Perfect! I used cherries from the freezer too. Kenneth--I remember mom got on to me one time for fixing way too much for breakfast for you guys and told me to just make cereal! Oh, it is just like Mom's! There is something so wholesome and heart-warming about a cobbler. I'll be posting on an apricot and cherry cobbler soon and will link to this one for sure.